The atomic arrangement at a relaxed InGaN/GaN interface. Research at ASU and Georgia Tech show layer-by-layer crystal growth may lead to record-breaking efficiencies in photovoltaic solar cell technology. 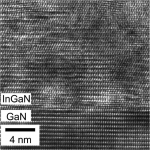 A collaboration between QESST researchers at Georgia Tech and Arizona State University has developed and demonstrated high quality InGaN thin films with high In compositions. These films show high optical properties that result from full-strain relaxation and uniform chemical composition profiles, in a range that was previously thought not possible. 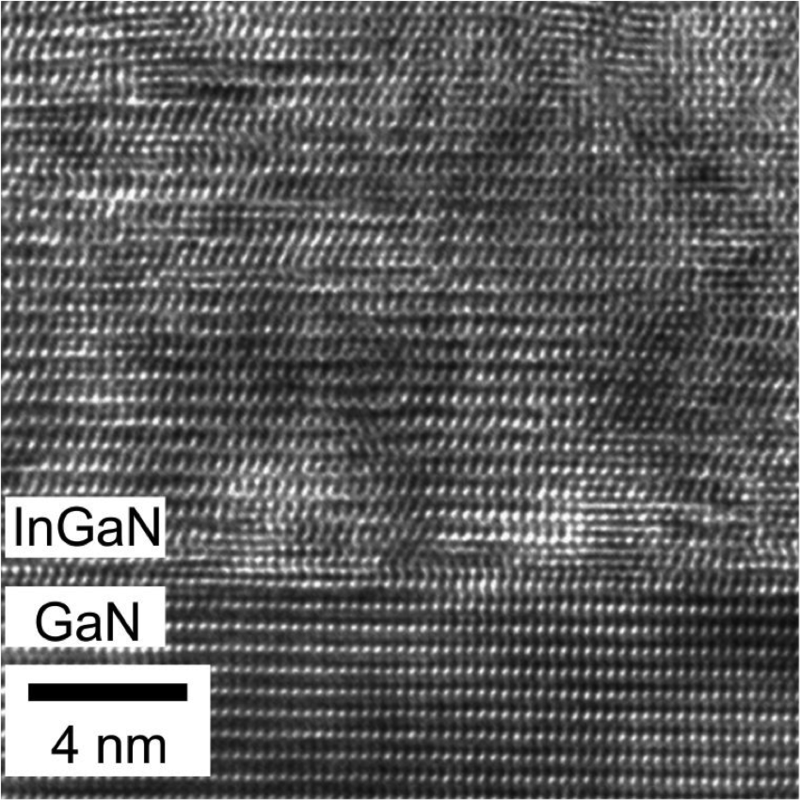 Thick InGaN films grown on GaN underlayers using metal-enhanced epitaxy (MME) by Professor Alan Doolittle’s group at Georgia Tech have been studied by Professor Fernando Ponce’s group at ASU. A detailed analysis at the nanometer scale indicates that films with In compositions greater than 60 percent exhibit excellent structural and electronic properties, contrary to predictions of compositional inhomogenities due to phase separation. This breakthrough should allow the production of high quality InGaN for use in tandem solar cells. Additionally, the material’s thermal stability should allow high-temperature operations in concentrating solar power technologies.